So, have you heard this business saying that the newly introduced Jeremiah Valeska (Jerome’s twin) won’t be called the Joker? Well, it’s starting to seem like we’re getting a clearer picture as to why. Personally, I thought it to be so that Gotham not interfere with anything being planned for the character by WB’s motion picture division – and I may very well be right – but it looks as though at least part of the reason has to do with an evolution of sorts being on the way. Now, before we delve further into that, let’s first look at a new image that’s surfaced, shall we? 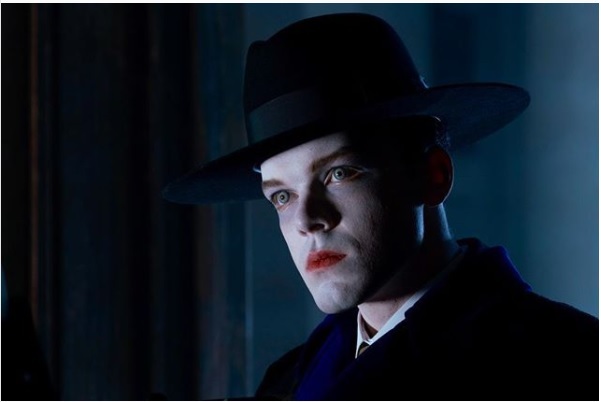 Brought to us by Cameron Monaghan’s Instagram page, this photo captioned with “Meet J” shows us what the Joker would look like if he were to literally walk out of a comic book. In other words, he’s a snappy dresser, has pale skin and wears red lipstick with nothing to accentuate his smile. Previously, makeup departments had used a variety of ways for Cesar Romero, Jack Nicholson and Heath Ledger to have smiles permanently on their faces, with Jared Leto having been the lone exception up until now. As for the subject of “J” that I was talking about earlier, I think that initial may emerge as an alias of sorts for Jeremiah’s criminal persona. If the trailer for the next episode to air, “A Dark Knight: That Old Corpse,” is to be taken at face value, Mr. Valeska will still be putting in some appearances as his usual self, making me wonder if “J” will be a competing personality that’ll eventually win out. Of course, the problem with this is that it’s incredibly close to what the show’s already done with Edward Nygma/the Riddler. But then again, that’s been an internal struggle the Prince of Puzzles has had to endure for the entire series, as opposed to a hurdle that the emerging Clown Prince of Crime could jump with his next appearance. I guess we’ll just have to wait and see. Gotham returns with new episodes on Thursday, May 3 on Fox.